The Healthmarque Orthotics are designed to stimulate various muscles in the foot that connect to five muscle chains in the body for postural control. The practitioner uses Applied Kinesiology muscle challenges to determine which foot muscles are weak. The common hard orthotics support arches by an external force and by taking over the muscle function and may weaken them. Using the principle that muscle pressure can be converted to electrical energy, the orthotic is made to apply pressure to the weak muscle points and so energies the associated muscle chain to help with pain and postural imbalance. As the world becomes urbanised the majority of the population is walking in shoes on hard level concrete surfaces. This does not allow for the proper reflex stimulation of the growing foot and muscle imbalances will occur. This is easily evidenced by simply looking at the shoes. An uneven wearing at the heels means that each side of the body is getting a different stimulation with every footstep and this may be balanced by wearing PZ Orthotics. Tissue is made of collagen which by its molecular structure is a liquid crystal and therefore a semi-conductor carrying positive charges. These positive charges (protons) carry information to all parts of the body acting in conjunction with the central nervous system. We suggest that this is the western scientific explanation of the Chinese Meridian system. As far as posture is concerned we stand in the earth’s gravitational force and this causes the protons to line up in five particular muscle chains to control posture and each chain has its own first link in a related muscle in the foot. The second property of a liquid crystal is the piezo-electrical effect which is the conversion of mechanical pressure to electrical energy. Thus the pressure points in the Healthmarque Orthotics induce an energy flow that modifies the actions of the muscle chains to help produce therapeutic benefits. This is the hypothesis that underlies the design of the Healthmarque Orthotic. A kinesiological testing of the plantar muscles allows an accredited Healthmarque practitioner to identify which foot muscles are not responding correctly and to be able to prescribe the appropriate Healthmarque PZ orthotic. 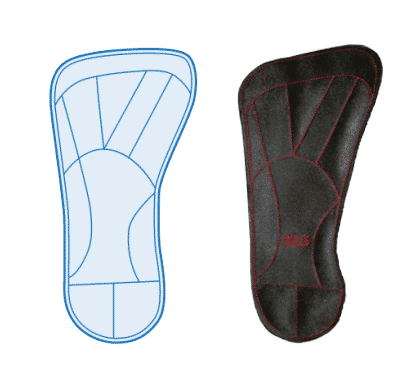 The Healthmarque PZ orthotic is a thin combination of rubber and synthetic suede containing pockets that are filled with a Poron® rubber designed to stimulate but not support the selected the plantar muscles to produce a postural correction. We believe that hard supporting orthotics will weaken the arches by taking over their muscle function.